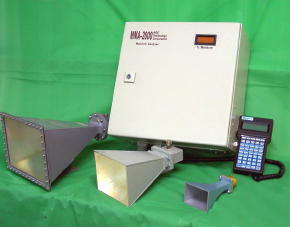 MMA 2000 Control Enclosure. 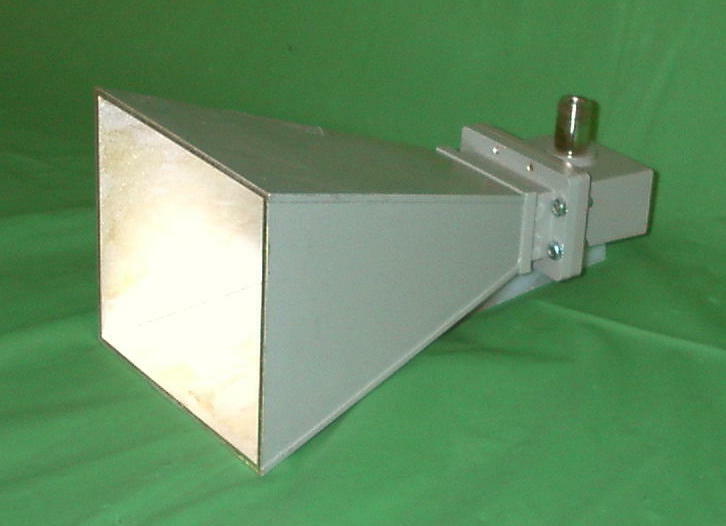 A sensor enclosure that contains the horn antennas and microwave electronics is separate, e.g., see photos below. 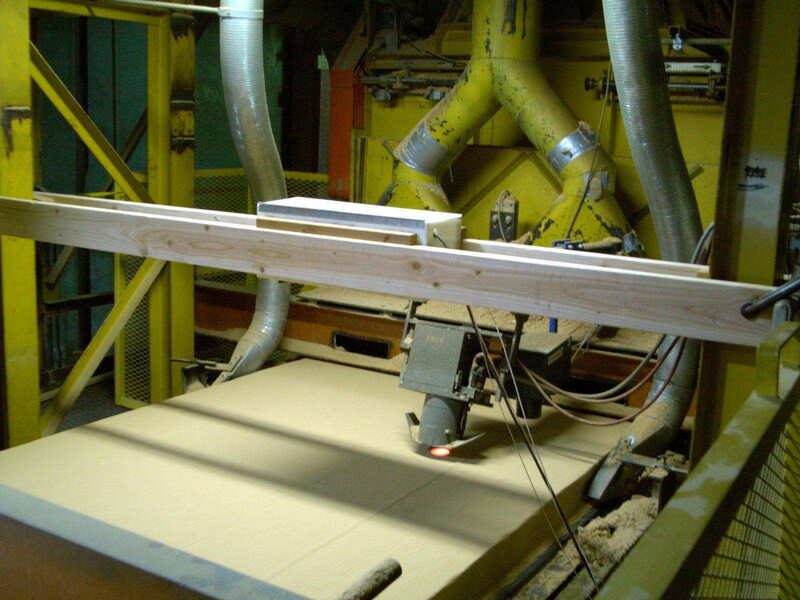 2-Channel, "double-bounce" sensor enclosure (6 horns + microwave electronics) installed above a 5ft wide particle board caul conveyor. The conduit on the left extends to the control enclosure. Here, the MMA monitors the mat basis weights [both wet (Mtot) and dry (Md)] and moisture content [%mc]. 1-Channel "double-bounce" MMA sensor enclosure (3 horns + microwave electronics seen at upper center ) temporarily mounted over a 5 ft wide MDF mat on a metal screen conveyor. An unrelated IR moisture gauge is also seen at lower center. The control enclosure is shown at right. 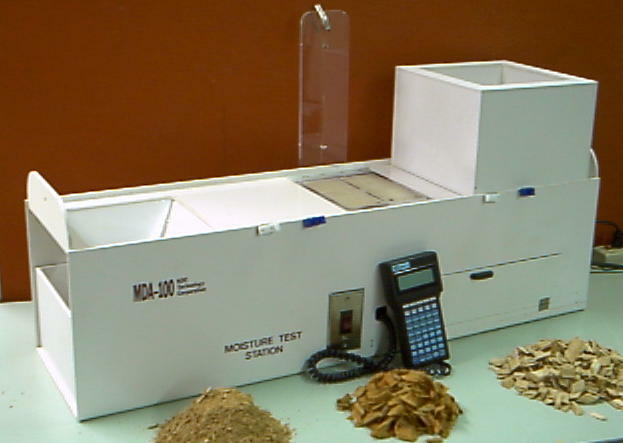 Here, the MMA monitors the MDF mat basis weights [both wet (Mtot) and dry (Md)] and moisture content [%mc]. 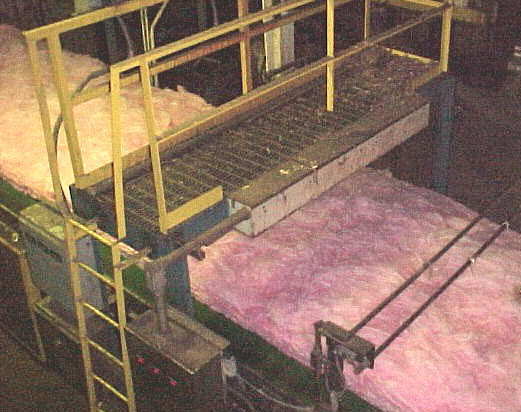 3-Channel "double-bounce" sensor enclosure (center) mounted above an 8 ft wide fiberglass wool mat that is conveyed by a composite belt that slides over a stationary metal reflecting plate. The control enclosure is seen at the lower left. 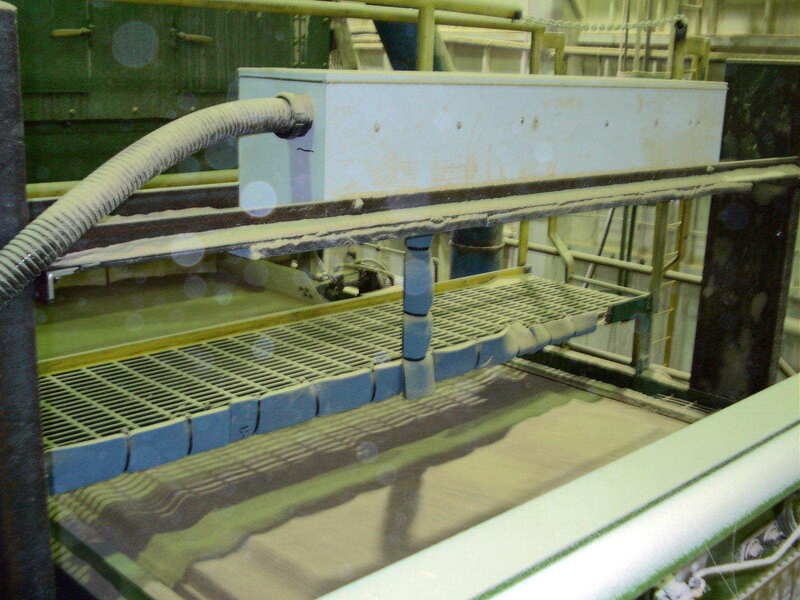 Moisture content at about 2% is being monitored for control of the downstream drying oven. 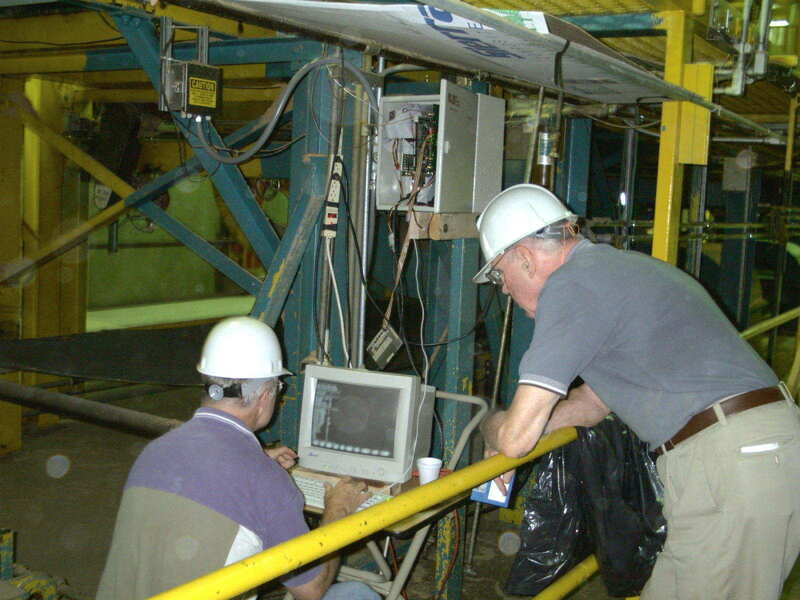 The control enclosure that is mounted beneath an elevated MDF metal screen conveyor is shown at top center. 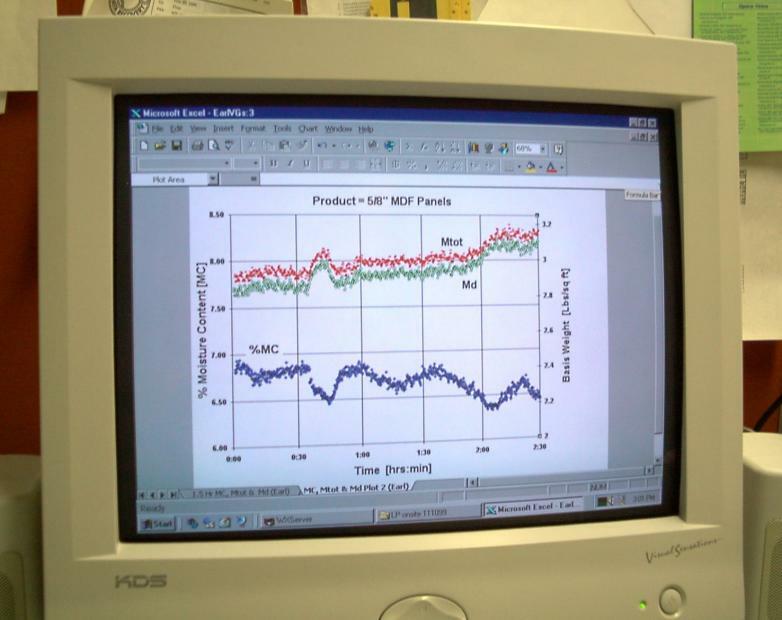 A monitor and keyboard are temporatily used for instrument setup. 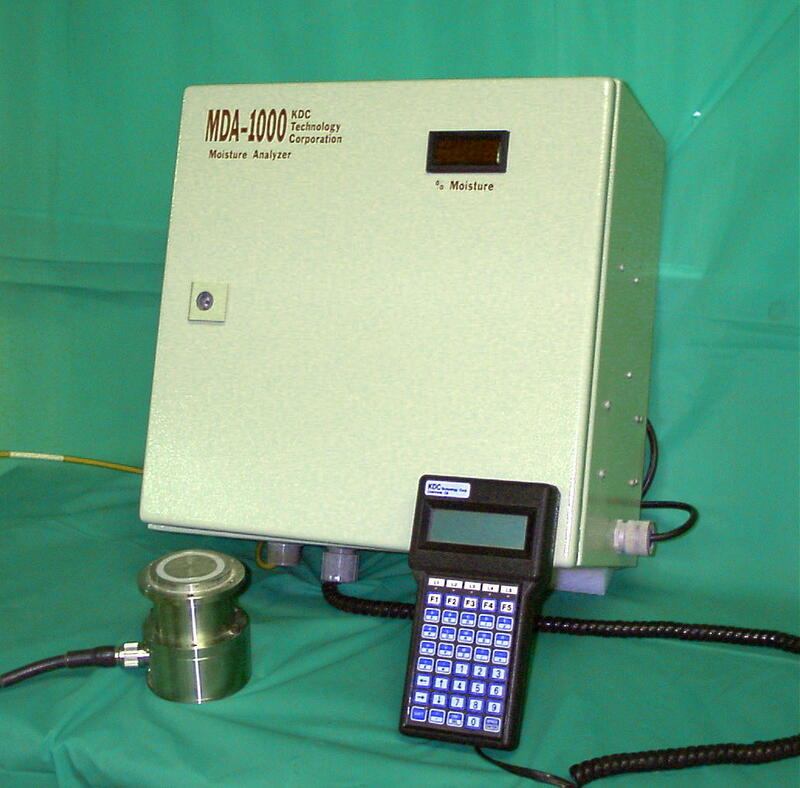 Click here to download technical specifications about the MMA-2000 Moisture and Dielectric Analyzer System. The above link opens a PDF file. Click here to download a free Adobe PDF reader. Copyright (c) 2003-2010 KDC Technology Corp. & KDC Technology Corp.